Dbacks take home the Chip! Tommy Loftus is your 2017 HR Derby champ! This one was a no brainer.... Sean was the most dominant player on both sides of the ball through playoffs, leading to his team's 4-0 Championship run. From the plate, Sean lead playoffs in: Avg. (.500), RBIs (15.. next closest was 6), hits (8), runs (9), and was second in OBP behind only Dylan Harshaw, finishing with a .692. As for his performance on the mound, Sean finished with a 4-0 record, throwing 15 innings with a 0.00 ERA, only allowing 5 hits and 5 walks compared to 24Ks, and even added a perfect game in game one of the championship. Safe to say Sean was on a mission come playoffs, and he definitely accomplished it. It feels weird to be putting Bleach in the two spot, since wiffleball is so heavily dominated by pitching, but what if I told you that the HR king and comeback player of the year also dominated on the mound through playoffs? In the miraculous upset the Yankees had over the O's, Bleach batted 3/11 (.273) with arguably the most clutch homerun of his lifetime, when he took Tloft deep to walkoff game two and the series. However, Bleach also came in for relief in both games, posting a 0.00 ERA over two innings, allowing just one baserunner (via walk) and collecting 4 Ks, a win, and a save. In addition to his double sided dominance in the series against the O's, Bleach pitched 5.5 innings against the Phillies in round two, again posting a 0.00 ERA, and collecting 2 more wins along with 9 Ks; not to mention 4 crucial RBIs in game 3 to give his team the 4-0 victory. After game one of the chip ended sourly for the Yanks, as Dane McGrath gave up 10 runs in just three innings, Bleach again stepped up to the challenge throwing 4 innings of one run wiffleball in game two; however, his dominance came to an end as the Dbacks scored 5 runs off him in the fifth, giving him his first loss in playoffs. Although Bleach's Yankees did not bring home the trophy, his dominance did not go unnoticed. Although this postseason did not go as Phillies' captain Colin Pollag had originally planned, his success through his series against the Yankees has still earned him a spot in our playoff top 5. Pollag finished the postseason with a 2.20 ERA through 13.5 innings, recording 23Ks compared to just 13BBs, and allowing only 6 earned runs (4 of which coming from one swing of the bat). In game one of the series, Pollag batted 1-3 with an RBI that would go on to win the Phillies the game, while throwing 5 shutout innings with 10Ks to secure the win (so basically the usual for Colin). In game two, things seemed the same, as Colin had rolled through the first 4 innings, allowing no hits while recording 5Ks; however, in the bottom of the 5th, the longtime vet ran into some trouble. After recording one out in the 5th and loading the bases, Second round pick Wayne Shambo belted a massive Grand Slam to force game 3 for the red hot Yankees. Although tired in game three, Pollag settled back down, allowing only 2 hits and 2 ER through 4 innings, but Bleach's shutout was too much for the Phillies to handle, as they went down 4-0 to lose the series. Pollag's performance was not up to his usual standards, but it was still extremely respectable, notching him the three spot in our playoff top 5. If it weren't for Nachbar's struggles at the plate this postseason (.111 avg., 0 RBIs, and a .238 OBP), he surely would've found himself a couple spots higher on the playoff top 5, for his pitching was nothing but the usual for the 2017 AL Cy Young winner. Nachbar lead the playoffs in innings pitched (19), while throwing 3 complete games and collecting 34 out of a possible 38Ks, and only walking 12 batters, en route to a 1.32 ERA. In the A's first series against the Royals, Tnach threw 10 innings, allowing only 1 one, and recording 18Ks to aid the A's in their 2-0 sweep in round one. As for round two, Nachbar didn't play much different, although he was crucially wounded by the longball. In game one of his series against the Dbacks, Nachbar threw 4 innings and allowed only one run thanks to a solo shot by Dbacks third rounder Nate Smith. The only problem was that with the way Sean was pitching, the one run translated into a game one loss. Again in game two Nachbar had brought his stuff, but was once again wounded by the longball. In game two Tnach threw 5 innings allowing 3 runs, all of which coming from a moonshot from Sean Bingnear. Although the A's run ended with a second round sweep, Nachbar had dominated in the playoffs and definitely deserved to be recognized in our playoff top 5. It's almost that time of the year again. Playoff teams and seedings are set, and teams are now preparing themselves for the grueling back-to-back games and series that will eventually decide who the champions of the 2017 RPWL season are. It is very safe to say that anything can happen within these playoffs and that every team has a very realistic chance of not only making the championship, but winning it as well. Before we get to predictions, we'll first take a look at how each team in the American League has done and their keys to a championship. The royals have gotten where they are right now behind rookie phenom, and potential rookie of the year, Zane Johnston's pitching and captain Chris Durning's bolstering hot batting. Durning will finish with the league's highest average by over 30 points and is currently boasting a 3 game RBI streak, all while accumulating a staggering 8 hits in his last 4 games played. Johnston follows in his captains footsteps with a .275 average on the year with 6 hits and 7 RBI's in his last 3 games played all while leading his team on the mound with a 3.71 ERA over a span of 41 innings while 4th in the league in strikeouts. Newly acquired Brendan Risley has done his part as well since joining the league with a respectable .129 average and .325 OBP and Frankie Campanile has awoken at the plate since his abysmal .000 campaign last year, as well as holding his own down on the mound when the Royals needed him. Stay. Hot. The Royals are arguably the hottest team in the league right now. Although they have lost 3 out of their last 5, they still are a .500+ team and have the ability to knock any pitcher off the mound at any time (paging 5th inning heroics against the Athletics) as they have the league's best batting average and the most RBI's. Even if the pitching isn't there (it usually is), they can beat any team and pose a huge threat any day of the week and twice on Sunday. A string of hits will rattle any pitcher and that's what the Royals have done best this season. Keeping the ball in play will keep the Royal's championship hopes alive. It is no surprise that the Athletics have finished 2nd in their division, despite the 0-3 start, but it is surprising how they've gotten here. No one in the league would have guessed that the A's would ride a 9 game winning streak behind the likes of Tyler Nachbar's pitching. The AL Cy Young finalist has pitched a staggering .56 ERA over 45 (!) innings pitched. In layman's terms, that's 5 earned runs, which is good for 2nd in the league. He also holds the 2nd best WHIP at 1.18, and has only allowed 35 walks, which is good for 3rd least among qualified pitchers. Not to mention being a menace when it comes to strikeouts at 72. The A's don't just consist of Nachbar though, captain Dylan Harshaw has held his own, pitching a solid 2.31 ERA over 17.1 innings. Not only has he been pitching well, but his play at the plate has been spectacular. Batting .237 on the season, he has gotten 6 hits in his last 7 games, along with 6 RBI's, and an astounding .857 in his last 5. Third man of the year finalist Jimmy Davis has produced above expectations, posting a .150 average and .417 OBP, with a very, very clutch 12 RBI's. Mike Ward has yet to play a game for the A's, but as shown during his time with the Brewers, he's known for working the count and making the pitcher work more than he should. All in all, this A's team is the real deal. Do not over pitch Tyler Nachbar. He can obviously pitch a big workload and be perfectly fine, but that isn't the point. It is a known fact around the league that Nachbar, for some odd reason, can not pitch well in the second half of a doubleheader. In the second game of a doubleheader, Nachbar is 1-1 with a 3.25 ERA and a 2.125 WHIP, a complete turn around from his season numbers. The biggest problem with this, is that playoffs is all about double headers. If the Athletics rely on Nachbar and history repeats itself, then it could spell doom for the A's. The good thing is, the Athletics have an abundance of pitching, and can rely on the Harshaw/Ward duo just long enough so that Nachbar can rest up a bit and continue to dominate the opposition. Speaking of history repeating itself, Sean Bingnear has captained his team to the number 1 seed, again. And again, Bingnear was able to prove his case to win yet another league MVP. Through the year, Bingnear has batted a respectable .323 with 20 hits, with 15 of them coming in the last 8 games, 25 RBI's, and .512 OBP. On the mound, Sean has pitched a very good 1.43 ERA over 35 innings, continuously proving he's one of the best in the RPWL without breaking a sweat. The only thing different from last year is that he can now rely on his draft selections so that he doesn't have to get through the playoffs by himself. Teddy Drescher, although not doing well at the plate with a .132 average and being hitless in his last 3 games, was able to notch himself as a nominee for Comeback Player of the Year and a surprising Cy Young nomination as Drescher pitched an unbelievable .62 ERA in 24 innings, and only giving up 1 earned run in his last 13 innings pitched. Teddy is not the only surprise, either. Second to last pick Joey Van Houten has been huge for the Diamondbacks, batting a very respectable .185 with 3 homeruns. Although his average is lower, JVH is still touting a plus .500 and an astounding 1.095 OPS, good for fourth among the league. The Diamondbacks also recently acquired Nate Smith, a very underrated player who can not only pitch (notching the 1st seed clinching save against the Royals) but can also bat and put the game on his shoulders if need be. Rely on your team. As before mentioned, Bingnear is coming into this years playoffs with a much better team than he did last year. It is scary how much better, actually. With that being said, Bingnear can relax on the gas pedal a bit and rest himself up for the championship without having to worry about his back up pitcher giving up a game winning grand slam. Teddy has enough gas left in the tank to pitch at least one complete game, and if not, Smith has shown enough reliability to pick up any slack that Drescher puts down so that Bingnear can pitch when he absolutely needs too. A healthy, relaxed, and fresh Bingnear is not good for any team who wants to make it far in the postseason. Although the Athletics can play multiple games back to back and win, Bingnear and company are going to be too fresh for the A's. Bingnear not having to rely just on himself this year is going to mean a lot more than what people think. Not only that, but the league has yet to figure out Drescher and how he pitches. The bye week means a lot in this league, and if the Diamondbacks were to lose to the Royals in their last regular season game, this would be a lot different, but the Dbacks are hungry for another title, and have too much momentum for the A's to handle. For the fourth week in a row the Phillies are featured on the Game of the Week but this time against the Royals. The interleague matchup was quite a good one as both team starters wasted no time getting in their groove. In the top of the third Royals starter Zane Johnston worked himself into trouble by walking the first three batters to load the bases. However, the rookie performed like a veteran in the situation by fanning the next two hitters not allowing a run to cross the plate. For the next three innings both Pollag and Johnston were going back and fourth recording strikeout after strikeout. After both teams remained scoreless after six the extra inning rule came into effect and would bring the third hit off in Tot Lot history. The extra inning hit off rule was nothing new to Phillies captain Colin Pollag as lost game one of the championship last year to it. The hit off was started off by Pollag and he sent the first ball flying over the fence but would eventually miss his last four attempts. While Colin only had one home run in five swings, Zane Johnston took the bat for the Royals but he was not able to capitalize as he too would only hit one home run. For round two of the hit off Albanese stepped to the dish for the Phillies and cranked two deep home runs in his five swings. The Royals captain Chris Durning would now need at least two home runs to stay alive or three to win but he was unable to hit one and the Phillies earned a hard fought victory. Colin Pollag- After a rough first couple of weeks on the mound the 2016 Cy Young Winner pitched better than ever in week five. With eleven innings of no earned runs, sixteen strikeouts, and only three walks the immense pitching led the Phillies to two wins and the top place in the North Division. Austin Bleacher- Late inning heroics from Bleacher once again brings a win to the Yankees as he walloped two home runs and two base knocks. Wayne Shambo- In his first career start Shambo tossed a five inning one hitter as the Yankees had a nice team effort victory. Zane Johnston- The rookie is playing a huge role for the Royals this season by producing from both the plate and the mound. Johnston threw eleven innings of no-hit wiffle ball as the Royals went one and one on the day. Oriole's for the chip- Before everyone starts to throw this prediction in the trash, let me explain. After opening day I think we all noticed two things; this team can hit, and this team has arguably two of the best pitchers in the league in their rotation. With Tommy Loftus and Dennis Donegan on the bump, this team might have the first actual pitching rotation in RPWL history, and at just the right time. With the new 14 game format this year, pitchers will be forced to throw more pitches, obviously leading to more wear-and-tear of the arms. With the discovery of Tommy's pitching talent, the Oriole's can ease the work load off Donegan and Loftus, leading to fresh arms come playoff time. As the previous juggernauts Bingnear and Pollag are forced to carry very large workloads, with the fresh arms of the O's give them the edge they need come August? In my opinion, the added arm and the consistent bats throughout the lineup, this team will be hoisting the trophy at the end of the year. Zane Johnston for ROY- Zane's role for his entire RPWL career has been as a back up pitcher for longtime captain Chris Durning. However, as soon as Zane started finding his form on the mound and had a chance to take over the starting spot for team Durning in 2016, he suffered a broken collarbone injury. The injury kept him off the field for almost the entire season, minus the last regular season game of the year. This year, Chris Durning was confident that Zane still had potential, and went with him 5th overall in the 2017 draft. During week one, Zane came up with a big game winning three-run homerun off of 2016 AL ROY Josh Butler who is no joke on the mound, followed by recording a perfect inning in the third for a save, giving the Royals a 6-3 victory over the Brewers. After his week one performance, Chris Durning clearly stated that Zane will be moving to the starter role, and if he keeps up his week one performance both at the plate and on the mound, he will be a serious candidate for rookie of the year. Frankie Campanile for Comeback Player of the Year- Last season was not kind to rookie Frankie Campanile, as he finished the year batting 0-15, with his most memorable at bat coming in the final game of the championship series. Down 2-1 with one out and the bases loaded, Frankie was struck out on three pitches by reliever Riley Brown, to secure the title for team Pollag. In the offseason, it was obvious Frankie would be a late pick, and he was. With the 5th pick in the third round, captain Chris Durning took his chances on Frankie and so far, he is not regretting it. With three hits on the year already, two of which for homeruns, and 4 scoreless innings on the mound, Frankie is turning out to be the steal of the third round. That being said, if Frankie can keep this up over the remainder of the season, he'll be a shoe-in for comeback player of the year. For the second straight week the Athletics versus Phillies matchup gave us quite a nail-biter. Not only was the game intense it would also make history by becoming the first five inning game in Ridley Park Wiffle Ball history. Due to the lack of players the A's would have to play the first two innings in the penalty so Phillies captain gave Vinny Albanese the start. The Athletic's took advantage as they knocked in a run from hits by both Dylan Harshaw and Tyler Nachbar. The leagues strike out leader Dylan Harshaw started on the bump for the Athletics and cruised through the bottom of the first by getting two very quick outs. As Colin Pollag took the mound in the top of the second it became a pitcher dual between him and Dylan as both pitcher's combined for fourteen strikeouts and only one walk. The Phillies scattered two hits in the bottom of the fourth including Meese Tobey's first career hit to make some noise but Harshaw responded with back to back strikeouts. With his team up by one in the bottom of the fifth Tyler Nachbar struck out the side to give the A's their first victory of the year in jaw dropping fashion. Tommy Loftus- Loftus had a record breaking day recording ten strikeouts in his no-hitter performance. He also went two for four at the plate in his teams seventeen to nothing win. Dennis Donegan- Just like his teammate Loftus, Donegan also set a record in week four by smashing six hits in his eleven at bats. He also knocked in seven runs in their easy dub. Frankie Campanile- The third round pick gave a lot of captains a bitter taste for not drafting him by slugging two home runs and nine RBI's in the Royals third win of the year. Chris Durning- Durning tossed his first no-hitter of the year and knocked in three for the Royals. Tyler Nachbar- Nachbar drove in his Athletic's only run and came up clutch with a save in the final inning over the Phillies for the A's first win of the year. Week three featured a pitching dual between veteran pitchers Dylan Harshaw and Colin Pollag. Harshaw got the best of Pollag in the top of the first as he got him to fly out and strike out looking on a nasty slider. The bottom of the first began with a leadoff walk from Pollag but he was regrouped quickly with two straight outs. Both pitchers dominated the second striking out the side to keep the game scoreless heading into the third. After walking Pollag and Albanese to start the third Dylan recorded a huge out for the Athletics by striking out Meese Tobey. With men on first and second and one out Colin Pollag ripped an RBI single up the middle to give the Phillies a one to nothing lead heading into the bottom of the third. After a walk drawn by Jimmy Davis the game ended as Nachbar and Harshaw went down swinging. The Phillies edged out the victory with the final score being one to nothing and Pollag picked up his first no-hitter of the year. Colin Pollag- Prior to week three Pollag's pitching was nowhere near what it was last season but he answered back this week. He threw a no-hitter with five strikeouts and knocked in the Phillies only run in a one to nothing victory over the Athletics. Chris Durning- Chris went one for one with four RBI's today in a come from behind win against the Rockies. Sean Bingnear- Continuing to be his normal self, Bingnear dominated on the mound only allowing one hit and knocked in his teams only run. Dane McGrath- For the second straight week McGrath collected a no hitter with only four walks in three innings of work. In week two the game of the week featured the largest comeback in the history of the lot. Things started off with the Phillie's ace Colin Pollag on the mound. It was an easy first two batters for Pollag as he struck out Bleacher and Liberio. Austin Bleacher was on the bump for the Yanks but he continued to struggle with control and walked in a run. In the top of the second Pollag looked shaky on the mound walking the first two batters but he received a huge break when the fill in field Teddy Drescher turned a double play on a hard stuck line drive by Bleacher. The Phillies opened the game up in the bottom of the second taking advantage of the inconsistent pitching. With his team up five to nothing Pollag drilled a grand slam to left center putting them up nine heading into the third. Things went differently for Colin in the third as he could not seem to throw a strike. After walking in three runs he decided to pull himself and put Albanese into the game. Nate Smith smacked a single followed by a grand slam from Bleacher and just like that the score was nine to eight the Phillies still leading by a run. After Vinny walked the next two batters, Austin came to the dish and once again smoked a three run shot giving him eight RBI's on the day but more important a two run cushion for his closing pitcher Jack Liberio. After allowing a hit to Pollag, Liberio recorded the save by striking out Albanese for a Yankees eleven to nine win. Dane McGrath- In his first career start McGrath had an unbelievable performance consisting of a no-hitter with only four walks. Most importantly was that he didn't allow a run and gave his team the one to nothing win. Josh Butler- Butler leadoff the game with his first home run of the year and boy was it a big one. It turned out to be the only run of the game and gave his team a well earned victory. Colin Pollag- Although he didn't bring his dominant pitching on the mound with him, Pollag still had a solid day at the plate. He went three for three with six runs batted in and stroked his first homer of the year. Austin Bleacher- Week in and week out Bleacher continues to provide a hot bat for the Yankees. This week he slugged two home runs with eight RBI's in his teams come from behind win. Tommy Loftus- Loftus pitched another gem in week two against the Rockies. He hurled a one run no-hitter in his team's seven to one romp. Opening Day's final game turned out to be one of the greatest games in Tot Lot history. The matchup was set between Dylan Harshaw's Athletic's visiting Sean Bingnear and the Diamondbacks. In the top of the first, Bingnear, like most pitchers in the league was having control issues. He quickly regrouped and struck out the next two hitters in the Athletic's lineup. In the bottom of the first Harshaw recorded a strikeout and was able to get Colin McCann to line out to end the inning. From then on both captains we're dealing and the two teams were both scoreless after three. In the top of the fourth the Athletic's once again put pressure on Sean Bingnear with bases loaded. But once again the ace was not fazed and was able to get the third overall pick Tyler Nachbar to strike out swinging on a nasty screwball. Teddy Drescher lead off the bottom of the fourth for the Diamondbacks and reached on an error. But Harshaw answered back with a huge strikeout on the 2016 AL Most Valuable Player in Bingnear. With one out and a man on first Joey Van Houston was sent to the dish. Joey, not very known much for his power smashed a two run walk off home run which broke up Dylan's no hitter. A rivalry may have just been set between the two teams as they look to play each other deeper in the season. Sean Bingnear- Sean had a very rough day at the plate going 0 for 4 with three strikeouts. However, Bingnear made up for the lack of offense by throwing an absolute gem. A four inning no hitter with eight strikeouts tying a single game record. This dominant pitching performance allowed his team to win in extra innings. 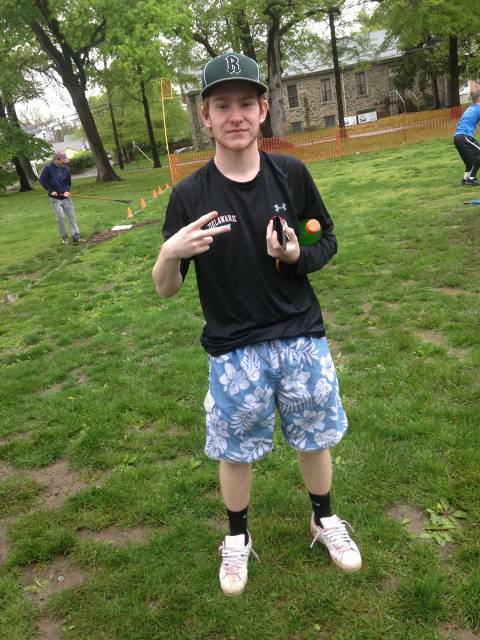 Joey Van Houten- Joey who was the 23rd pick in this years draft had himself the best game of his wiffle ball career. JVH had a keen eye at the plate drawing three walks against ace Dylan Harahaw. With his team down to their final out before the hit-off joey sent a blast to dead center field ending the game in walk off fashion. Zane Johnston- Johnston had a well rounded performance in week one. He hit a go ahead three run homer in the bottom of the second and also recorded the save with a one-two inning proving that he has stater potential. Dylan Harshaw- Not many losing pitchers get featured in the players of the week but Harshaw pitched an immaculate game. Dylan hurled one of the most dominant games of his career having five strikeouts while only walking 6, and only allowing one run through four innings of work. Dennis Donegan- Wether it was pitching or batting Donegan brought his stuff today. Dennis struck out the side twice in his two innings pitched and also poked a grand slam to right field ending the day with six runs batted in. Tommy Loftus- Tommy went two for three at the dish with two base knocks and provided four runs batted in. But the most surprising thing about Loftus' day was his lights out third inning on the mound. Showing the league that the Oriole's have two aces between him and Donegan. With opening day of 2017 only a little over a month out, we figured we'd throw it back to the final out of last year's championship. The situation? Bottom third, two outs, bases loaded, down one run for rookie Frankie Campanile. Wiffleball season is upon us... As the weather starts to heat up, and schools start to let out, there's only a month and a half left until the Ridley Park Wiffleball League opens up the 2017 season. As shown in the countdown, the draft is in a little over a month away (May 21st) and then players will get two weeks to practice with their teams before June 3rd. Just thought I'd throw out this little throwback of longtime wiffler Wayne Shambo who decided to break out the swim trunks for the rainy opening day we encountered last season. Let's hope mother nature is kind to us this year, and I hope to see you all come hang out!!! 5.) AdMyer Greatness- Team Myers had a mediocre regular season only winning four of their ten games. Their captain Greg Myers put up decent numbers, but there was nothing really to get excited about. However, Greg took it upon himself to have a hell of a postseason series. Facing up against Team Albanese, the second best team in the league, it looked to be a tough matchup. That was not the case for Greg; in game one he crushed two balls well over the fence and threw a no hit gem, winning the game three to nothing. In game two, Myers proved that his game one performance was no fluke as he delivered another pair of home runs, including a series ending walk off home run knocking out the second seeded Team Albanese. Greg ended the series with four homers, eight RBI's, and two wins from the rubber. His cinderella story came to an end in the next round in which he lost to team Pollag. Myers retired from wiffleball in 2016 and will greatly be missed. 4.) InZane Ending- Opening Day featured an American League thriller between Team Durning and Team Volpone. Chris "The G.O.A.T" Durning known for his amazing lights out pitching did just that in opening day striking out eight batters. The real surprise was the rookie Jay Paul Volpone, who performed phenomenally and matched Durning's eight strikeouts and only walked three walks. Due to the dominant pitching, the game led to the first and only hit-off of the regular season. Both captains sent there best hitting teammates to bat. With the rainy, wet conditions, Team Volpone's Tyler Nachbar struggled and unfortunately was unable to hit any home runs. The young slugger Zane Johnston followed in Nachbar's footsteps and could not hit a single home run in his first 4 swings. However, on his final swing he sent the ball soaring over the right field fence and gave his team the dub. Although Volpone could not complete the upset he did show that he can compete with the best pitchers in the league. 3.) Vin for the Win- The third game of Opening Day consisted of the number one power ranked Team Pollag and the eighth ranked Team Albanese. Team Albanese brought pressure early by loading up the bases loaded in the top of the first. Pollag was able to regroup and strike the next two batters not allowing a run to score but Team Albanese showed life. Pollag continued to struggle from the mound and allowed a walk to Donegan to start the third. Vinny took advantage of Colin's sorry slider and hit the most notorious home run of his career. Everybody spectating the game was fanatical and shocked the young Vinny Albanese just homered off one of the leagues best pitchers. Vinny also came in and closed the game the bottom of the third to complete a huge unexpected upset. 2.) The Chip- As the summer came to an end and many of the players were getting ready to head back to school, the league still had one series left, Pollag versus Bingnear. The two had been enemies when it came to sports since the day they met and the championship showed just how impassioned the rivalry was. In game one both pitchers came out on fire dealing k's back and forth. The pitching was so dominate both teams could barely produce base runners let alone hits. For the first time since week one the game ended up going into the nerve-racking extra inning hit-off which sent both captains to the plate. Pollag who had been clutch all year for his team came up short and Bingnear single handily won his team game one with his heroic home run. The series was far from over and game two started off with a bang. In the bottom of the first, Colin hit a lead off single and according to league rules it meant that Bingnear could not pitch in the final inning. Both teams remained scoreless until the bottom of the third which brought Dane McGrath to the mound. It was a very tough task for McGrath to keep the score tied because it would be his first pitching appearance in the post season. With bases loaded one out Riley Brown delivered the most iconic moment of the 2016 season, a walk off grand slam to end game two. In the third and final game Bingnear and Pollag were back to their normal routines on the mound striking out every batter they faced. But in the bottom of the second Sean roped a game changing single to shallow right. In the top of the third Team Pollag was able to scatter two runs due to walks produced by Joey Van Houten and Colin Pollag. In the bottom of the third Riley Brown stepped on the rubber in the biggest pitching performance of his wiffle ball career. He had a small cushion of two runs but he fell into the same situation as McGrath, this would be his first time pitching in the postseason. After walking the first two batter he was able to regroup with a strikeout. The strikeout was followed by two more walks and Team Bingnear was only down one run with bases loaded one out. 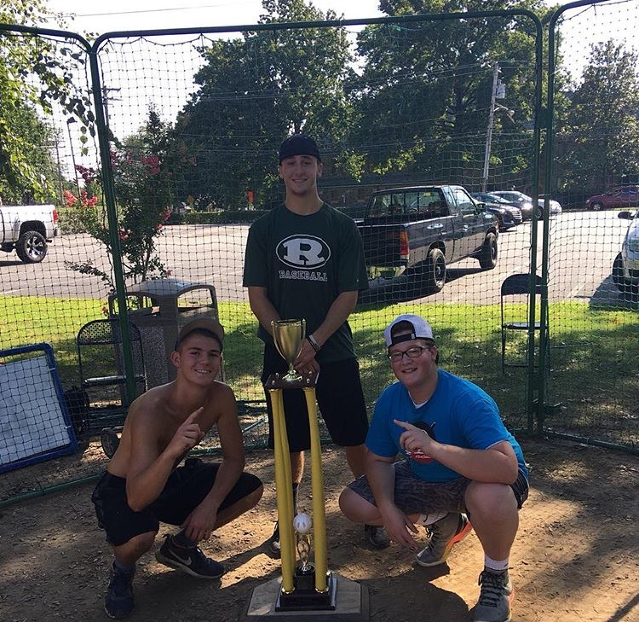 Frank Campanile was at the dish looking to deliver his first hit of the year but Riley Brown ended his heroic visions and struck him out and won his team the championship. The story book ending was one of the most memorable moments of the 2016 season. 1.) 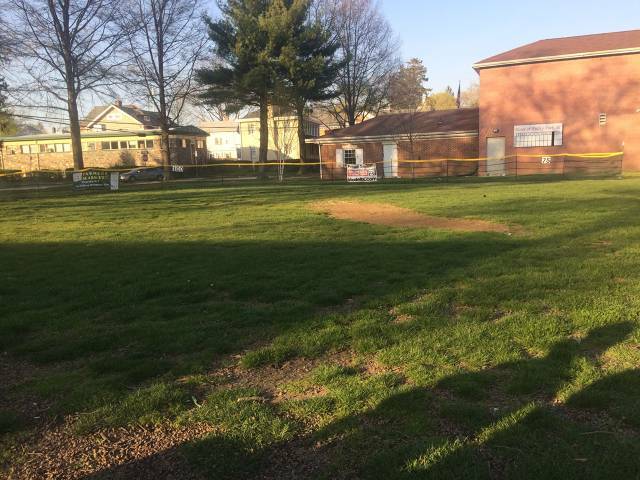 Save the Lot- The first four weeks were impeccable for the Ridley Park Wiffle Ball League. The weather was not a problem, each game was played on time, and every week more and more fans flocked to watch the exciting games played by their friends and classmates. Week five appeared to be another great week until a big shiny red car pulled up into the parking lot. The Ridley police officer hopped out of his car and politely informed us that this would be our last week at the Tot Lot because of anonymous complaints. The whole league was devastated but league commissioner Dylan Harshaw came to the rescue. He created a Facebook page titled "Save the Lot" which explained our situation of how the police told us we couldn't play at the field anymore. It didn't take long until the community became outraged and started taking our side. One of our supporters actually informed the local news and they wanted to do a story on us. Not wanting the bad publicity the complaints soon came to an end and we were able to play again. All the support from our players, parents, and community allowed us to save the lot and make all these memories possible. The championship is set and will feature longtime Nall rivals, Sean Bingnear and Colin Pollag. After an exciting regular season matchup between these two (6-5 win for Pollag) fans can expect a strong three game series from the two teams. The series features arguably the two most dominant hitters and pitchers in the league and should be nothing short of a strong, even matchup. The championship is set for Thursday, August 18th, at approximately 2:30 PM. We will be announcing our end of the year awards beforehand. Feel free to come join us as we bring this year in wiffleball to a close. The second round of playoffs featured an ALCS matchup between Bingnear and Harshaw, and an NLCS matchup between Myers and Pollag. Pollag's dominance continued as he hit 3 homeruns in his series vs Myers and pitched well enough to win the first two games, completing the sweep. For the ALCS, pitching troubles immensly hurt team Harshaw as it seemed neither of their pitchers could find the strike zone. This lead to two wins for team Bingnear as they also completed the sweep. The first round of playoffs featured 4 matchups: for the AL, Harshaw played Volpone and Bingnear faced off against Durning. Harshaw completed the sweep against Volpone, winning game 1 14-13 due to a walk off single by AL ROY candidate Josh Butler. Game 2 was a more dominant win, as Harshaw pitched a no hitter and won the game by a score of 8-2. For Bingnear Durning, Bingnear won the first game of the series by a dominant 4-0. Facing elimination in game 2, Durning decided to pitch through the pain of his shoulder and was able to secure a 5-3 win to force game 3. In a winner take all battle, both Bingnear and Durning carried no hitters into the third inning; however, after giving up a single and then walking 3 batters, Durning gave up a 1-0 lead. Determined to keep his team in the game, Durning struck out the next to batters to keep the deficit to 1. 1 run was all Sean needed as he went on to record 2 straight strike outs and move on to the ALCS. In the national league, team Pollag won their series vs. Bleacher by forfeit, 2-0. Greg Myers was the true stand out star in the opening round of playoffs and was very much the reason his team advanced. Playing against a tough opponent, second place team Albanese lead by rookie pitcher Dennis Donegan (NL ROY frontrunner), Greg needed to bring evrything if he wanted to win this series. Leading off the series with a solo homerun, Greg was all business. Dominating both at the plate and on the mound, Greg hit another home run and was able to easily win game 1 by a score of 3-0. Game two did not come as easily. After Greg hit a grandslam in the first inning of game two, Team Albanese slowly fought back and tied the game at 4 in the top of the third. the game was then forced to extras and in the bottom of the 4th, Myers bat struck again as he hit a walkoff homerun to advance to the NLCS.